Caravan and trailer safety check over 2000kg. 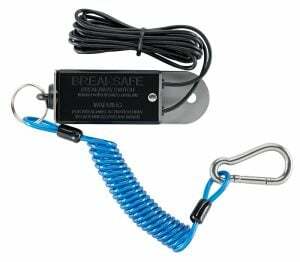 Safety switch lanyards are approximately 120cm long. On the other hand, safety chains are 64cm long. When lanyards are not installed correctly, it is impossible to disengage the breakaway pin, as intended. The manufacturer perfectly matches breakaway lanyards with safety chains. When the pin is pulled, safety chains are approaching full stretch. Further, this test is easily completed by attaching your chains to the tow bar and push your rig backwards. In extreme circumstances, is possible for the caravan or trailer to become detached from the tow vehicle and NOT engage the electric trailer brakes. The minimum period for an electric brake system application is 15 minutes. Couplemate recommends the following inspections by owners and inspection stations. Firstly, check the lanyard is shorter than the caravan safety chains. Secondly, ensure breakaway switches are affected by water ingress thereby causing failure when the pin is pulled. Thirdly, pull the pin on your breakaway before every journey to test current flow to the electric brakes. You should hear your magnets engage. Electric brake magnets make an audible sound when engaging. As a result of not hearing your magnets engage, take your rig to your service centre for investigation. We do not recommend coil breakaway switches. Although they are nice and tidy, this type of connection cannot be adjusted. Therefore, it is possible for the caravan to detach from the tow vehicle whilst safety chains are at full stretch. As a result, it is possible the pin from the safety switch will not disengage the electric brakes to stop the caravan. Lanyards must be installed correctly and checked at every service by a caravan dealer. Breakaway pins are subject to UV degradation. The breakaway switch must be replaced once the pin brakes due to age. Install breakaway switches facing forward for the pin to be pulled effectively during detachment. Inspect the inside of the switch contacts for signs of dirt which causes failure during testing. A breakaway switch with rubber boot cover can be purchased here. A breakaway switch may have to delivery 12.8 Amps to four magnets on a tandem rig. If the contacts are dirty, heat will be generated in the cable. With the chains connected and jockey wheel on the ground, push the caravan so that the safety chains are at full stretch. If the pin fails top pull, measure the slack lanyard and shorten. If the breakaway switch fails after being pulled, we recommend switch replacement and be sure to include a rubber boot to help prevent future water ingress. Notably, breakaway switches are designed to engage electric brakes if the trailer or caravan becomes detached. During excessive sway, caravans can become dislodged. When the pin is dislodged, the brakes are immediately engaged thereby stopped the sway and braking the caravan to a stop. I could be wrong but wouldn’t you think any person towing a trailer over 2 tonne even those with a 5th grade education, would know that. Hello Ralph, You are right Ralph. Shortening lanyards has not even occurred to the experts. Many breakaway instructions do not indicate the lanyard should be shortened. This is a guess, but I suspect over 90% of caravans have incorrectly installed lanyards. Hopefully, folks might share this information. I would assume that the dealer would check this out on delivery of the van, but have been taught never to assume anything, and would the dealer check the system on scheduled servicings? Probably not, but worth asking the question next time it is due. The purpose of the post was to inform people about the issue. I think we are the only company in Australia that has issued this information via an alert. DIY does require a little knowledge and research before tackling even the most obvious of jobs.